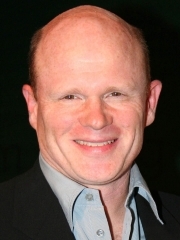 Paul David McCrane is an American film, television and theatre actor, as well as an occasional television director. He is perhaps best known for his portrayal of Montgomery MacNeil in the 1980 film Fame and Dr. Robert Romano on the NBC medical drama television series ER. McCrane was born in Philadelphia, Pennsylvania, the son of Eileen C. (née Manyak), a nurse, and James J. McCrane, Jr., an actor and writer. He has a brother, Jim, and three sisters, Maureen, Barbara, and Deirdre. His family moved to Richboro, Pennsylvania, where he lived until he moved to New York City after graduating from Holy Ghost Preparatory School. McCrane's roles include Emil Antonowsky in RoboCop, Montgomery MacNeil in Fame, astronaut Pete Conrad in From the Earth to the Moon, Guard Trout in The Shawshank Redemption, cancer-absorbing mutant Leonard Betts in The X-Files and Dr. Robert "Rocket" Romano on ER. He starred on ER from 1997-2003 and returned in 2008 for one episode during its 15th and final season. More recently, he has guest-starred in 24 seasons 5 and 6 as Graem Bauer. He has also appeared on Ugly Betty and CSI: Crime Scene Investigation. He could also be seen in an early role when he was just 17 years of age in a short scene in Rocky II, playing a young patient who asks for Rocky's autograph on his cast. In addition, McCrane was the lead vocalist on three songs in Fame: "Dogs in the Yard," "Miles From Here," and "Is it Okay if I Call You Mine?" . He also had a solo in "I Sing the Body Electric." In 2011, McCrane took on the recurring role of Assistant District Attorney Josh Peyton in the NBC television program Harry's Law, a project of producer David E. Kelley. McCrane won the 2011 Emmy Award for Guest Actor in a Drama Series for his performance in the role. McCrane married Dana Kellin, a jewelry designer, in 1998. They have two children, William Thomas and Noa Catherine. Whole or part of the information contained in this card come from the Wikipedia article "Paul McCrane", licensed under CC-BY-SA full list of contributors here.